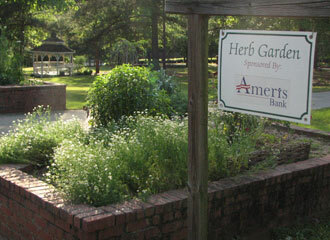 The Herb Garden invites you to walk up and touch, see, smell, and even taste the culinary, aromatic and medicinal herbs that fill the raised beds! Located just to the west of the Rose Garden and connected by a paved walkway, the Herb Garden is meant to be appreciated up close. The four raised beds each contain herbs that are loosely grouped into four broad categories according to their uses: Medicinal, Culinary, Fragrance, or Ornamental.